The wedding ceremony is the highlight of the wedding weekend. Everyone’s duties are now done and everything is in place, the venue is beautiful and inviting. It’s time to enjoy the celebration. The memories the wedding party made during preparation today will be cherished forever. 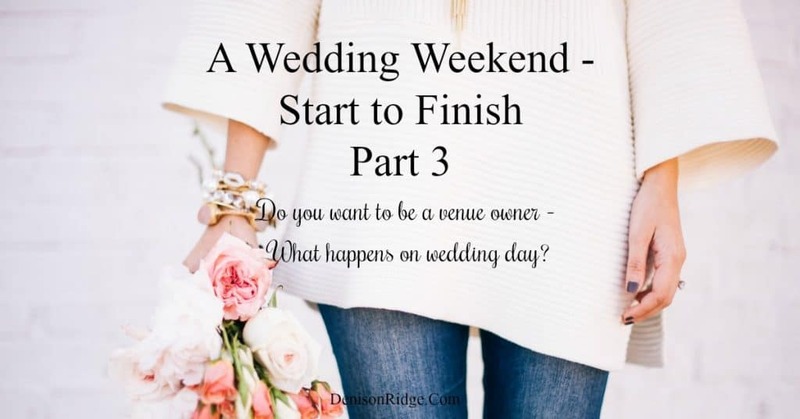 Before we continue part 3 of our wedding day schedule post, be sure you have read part two of our series. And if you are just joining us you can find part one here. Whew. Now, while everyone is seated and the ceremony is commencing I will take photos of the décor that I like, so I will have photos for my website. I must also check to make sure the hand wash station is cleaned up and if the hand towel holder needs a refill. Hubby Les and I will watch for late comers; making sure everyone at the ceremony area is facing the bride and groom, at the front, before letting late arrivals go down the path to find a chair. The Officiate has added the chair instructions to her announcement list. This makes for less confusion about chair removal. Guests are also informed on how many chairs go around each table. I am responsible for putting the – stairs are closed – sign up at the bottom of the stairs before the ceremony is over. I do not want guest brining chairs up the staircase; for safety reasons. The ceremony is over now and the guests start filing into the reception area. Groomsmen will bring chairs to the reception area for those that can’t. As soon as everyone has a place to sit, the catering starts and the DJ will now oversee the evening schedule. We usually get to sit down during this time to catch our breath, get a much needed drink of water and use the restroom. There might be a few knocks at the office door for things, but it is much quieter now. Les and I will go out at least once an hour to check and see if our guests need anything and to remove garbage. The bar is open and people are milling around for the few minutes before dinner is served. Then toasts will happen, with cake serving to follow. We mustn’t forget the bouquet toss and garter throw too. The DJ at this particular wedding only had to be told twice to lower the mic sound. This was so refreshing! I’m sorry but the DJ’s are so disrespectful. Some weddings it is a constant battle. At some point we might make clients choose from our vendor list; those who respect our venue. I notice on one of my check in sessions that someone has dumped ice from one of the tubs right where people will walk on it. The bride’s dad and I quickly shove the ice into the nearest flower bed so it will not turn into a slippery mess. When we can tell things are winding down, I will talk to the person in charge of clean up and let them know again, what needs to be done. They are responsible for getting the tables cleaned off. People leave cell phones, sunglasses, purses etc. I don’t want to be responsible for lost items. While they are getting all their belongings together we are spot cleaning the linens and then bagging them. We will stack chairs and tables on the patio (out of the sprinkler systems way) which will be remove the next day to the barn. Large décor that belongs to the venue will be put away by us. The Shepard staffs and pergola décor (if mine) will be removed by us. Extra tables, chalkboards and water tubs are our responsibility. Everything needs to be in the garbage that they do not want. A lot of times I will just have them put my things on a table (garlands, jars, beverage containers, coffee maker, etc.) and I will sort them out the next day and put them away. Sometimes it is easier to do things yourself so everyone can go home at a decent time. After everyone is gone we go around and gather all the garbage up and get it in the truck to take to the dump the next day. I don’t like leaving garbage in the groomsman cottage, bridal room, and barn, on the patio or any other place. You never know what has been put in the garbage. Get the stinky out! The evening ends on a great note. Wonderful complements on the venue by guests and families of our bride and groom. That really makes it all worth it to hubby Les and me. When our clients and their guest have a memorable time at the venue we have done our job. The last thing we do is set the sprinkler system to run. Okay, maybe not the last. Les and I have started sitting on the deck with a glass of wine in hand for about 20 minutes. It’s time to wind down, reflect and enjoy those amazingly beautiful stars that pepper the night sky. If we have learned anything in the last 8 years it’s to enjoy the journey. Take time out to visit with guests and take time out for you too. Teri, that would be me, is up at 5:30. I’m extremely tired today. I wish I could sleep in, but I can’t. Les will be up later so I putter around until he wakes up. We’ll do the heavy chairs and tables at that time. I grab a garbage bag. There are cigarette butts to remove from the parking lot, plastic cups are here and there as well as water bottles, candy wrappers and I even found cupcakes that sat out all night and were wet down with the sprinkler system. I’m surprised Ozzy our family dog didn’t find them the night before when he scavenges the lawn for leftover goodies; after being let out of the garage. I’m always a bit upset when I’m so tired that I can’t stay awake in Sunday service. I’m thankful that our church has the option to watch it from home. So that is what we do this day. After the service I vacuum and then Les will mop when he gets home from the dump run. I also clean the groomsman cottage and bridal room. Again I vacuum, wash the mirrors, clean all door knobs and counters and toilets. Then hubby Les comes and makes the floors all shinny and clean. The last thing we get too is the tables and chairs. We use our new trailer for the tables and sometimes the chairs. Les would rather use the blue Ford truck for chairs because he can do them all at once. The trailer has to make trips back and forth. 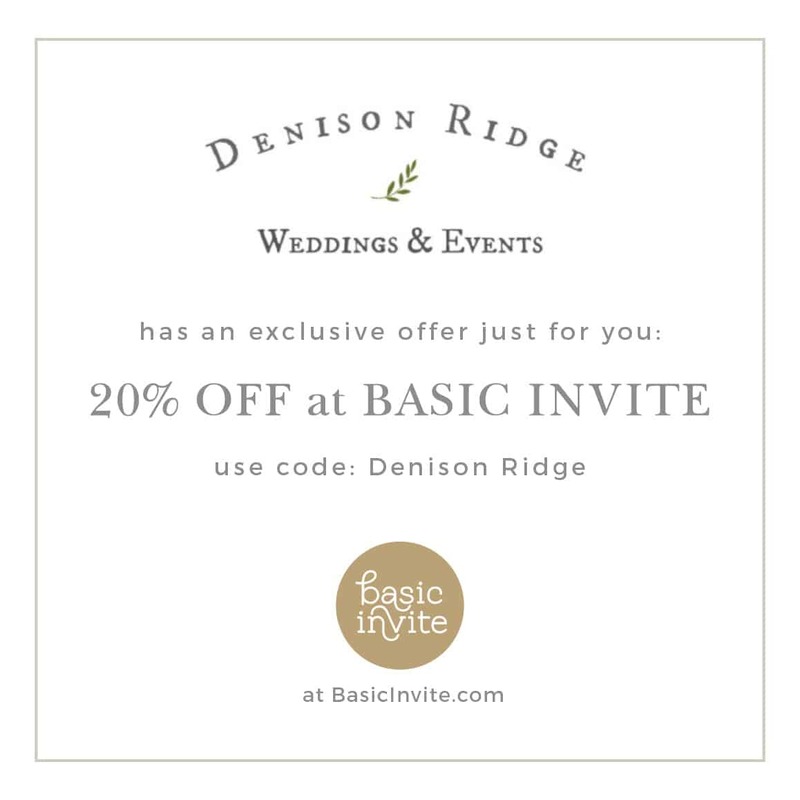 I hope you have a better understanding of what a wedding day looks like here on the Ridge. Of course, every wedding is a bit different and will have different issues to address. I’m always thinking on my feet and making adjustments. That is the fun part for me, lol; never a dull moment. What’s the fun part for you on wedding day?